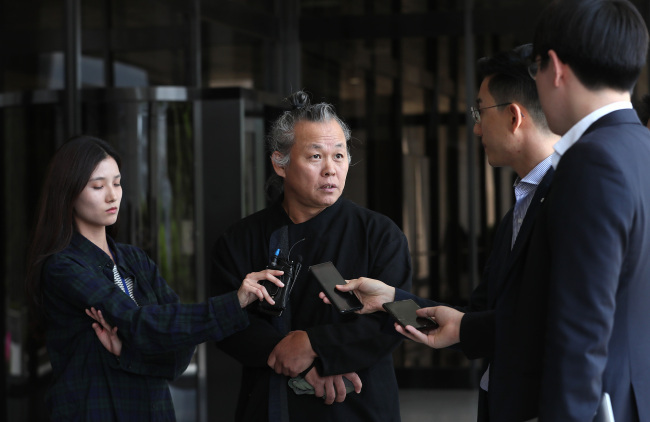 Despite the multiple testimonies of alleged sexual misconduct against him, filmmaker Kim Ki-duk remains adamant he is innocent, and has even gone on to bash his accusers as being ungrateful. “Making movies, I think I have respected actors and staff in my own way. Some parts may have been disappointing, but it is sad that (the accusers) are repaying my kindness in a hurtful way,” Kim said in front of the Seoul Central District Prosecutors’ Office. The disgraced director has filed false accusation and defamation suits against three actresses and MBC’s “PD Notebook” for falsely accusing him of sexual harassment and sexual assault. He appeared before prosecutors Tuesday as a plaintiff for the lawsuit. An unnamed actress sued Kim last year for sexually and physically harassing her on set. The case was dropped by the prosecution in December due to a lack of evidence, though Kim was fined by the court in a summary order for slapping the actress in the face. The actress appealed the decision to the court, but was denied. In March, MBC’s investigative “PD Notebook” reported sexual misconduct allegations against Kim, featuring testimonies from the actress who had sued Kim and two additional actresses. One accused him of sexually harassing her at an interview, while the other said Kim, actor Cho Jae-hyun and his manager raped her. “It was like being bombed in the middle of the night. I was in a panic, unable to make any value judgement. It was an unimaginable event,” he said, adding it took a while for matters to be legally sorted out. “What makes me the saddest is that (‘PD Notebook’) show was aired before the release of the film. The release was canceled. Actors and staff are desperately waiting for the premiere. The damage is grave,” he said. He will get the film screened, even if he has to pay for it, Kim said. He also revealed his future plans. “A major foreign producer suggested co-producing, I am preparing it with my script. The shooting will start in October and I will be directing the production,” Kim said. Meanwhile, it was reported Monday that Kim is going through divorce proceedings.